Home beauty Diet fact fitness Food Girls Guys Health & Wellness Health and Wellness Interesting knowledge Nutritions recent slider Viral Section vs Do You Have Bloated Stomach? Warning Signs You Should Never Ignore! If you lose 10 percent of your overall body weight without any additional physical activity or change in your daily diet routine, then you need to be worried. 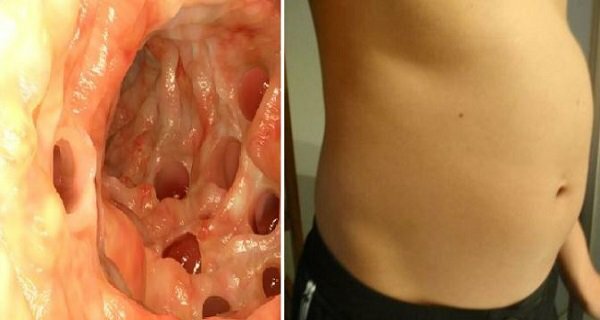 This may be a sign of intestinal cancer and it makes you feel satiated because it presses the stomach. It can also mean that you have a tumor, which reduces your appetite. This is a health condition which makes you look as you’ve gained weight and your waist- line is expanded. This condition occurs due to excessive amount of liquid in your stomach. You may look so bloated as if you are pregnant. This is almost always a sign of liver disease. The most common symptoms which indicate that the cancer has spread to the liver are jaundice, yellow eyes and skin with bloating as well. But these symptoms can also be linked with hepatitis. Bowel tumor and obstruction made from scar tissue can be linked to nausea and vomiting and with bloating and severe and sudden stomach pain as well. You must visit a doctor immediately as these symptoms may be a sign of lethal bowel perforation. The pain which occurs from time to time happens because the bowels contain food and fluids and as they try to go out through the obstruction, the pain becomes more severe. Bloating can also occur in women who are bleeding between their periods or after menopause. This condition is rarely a sign of some deadly disease, but rather happens due to hemorrhoids, endometrial atrophy, fibroids or irregular menstrual cycle.